Kenneth George King was born in 1944 in London and brought up with his two brothers, James and Anthony, in the village of Ewhurst near Dorking, Surrey. His American born father died when Kenneth was nine. The young King was a border at Stoke House, Seaford, East Sussex, and later Charterhouse, in Godalming, Surrey. He later went to Trinity College, Cambridge and whilst still an undergraduate, in 1965 wrote and sang "Everyone's Gone to the Moon", which reached the top 5 of the UK singles charts. Worldwide, the song sold over four million copies, peaking in the Billboard Chart at number 17. In the same year, wrote and produced "It's Good News Week" by Hedgehoppers Anonymous. The group were Royal Air Force personnel based at RAF Wittering, near Peterborough. The single sold well in the UK, US and Australia. 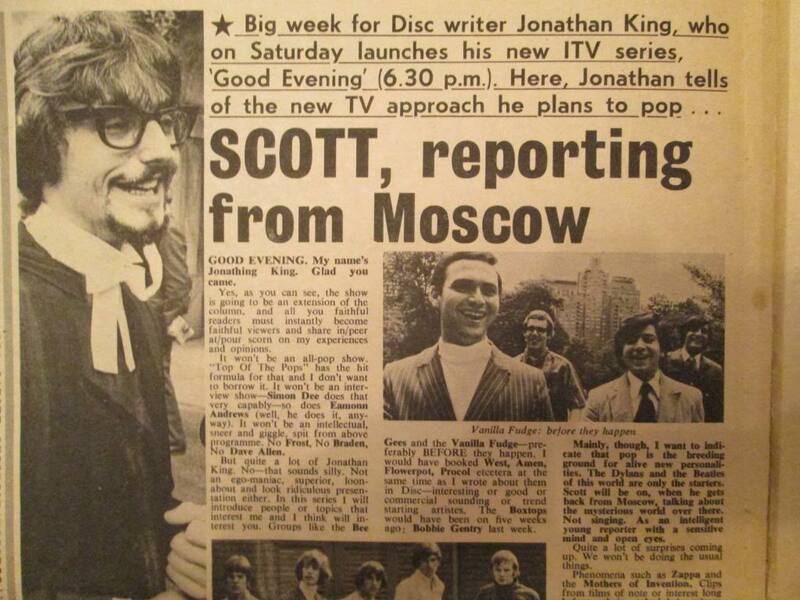 When he left university, he presented a television show on ITV, Good Evening ( I'm Jonathan King). The program ran for six months on Saturday evenings and featured many up and coming acts, including a few controversial expose. For a time, he worked as an unofficial personal assistant to Sir Edward Lewis, the founder of Decca Records. Jonathan King became a popular producer and worked with many acts including the band that would become Genesis. The group were pupils from his old school, Charterhouse and after hearing them he decided to become their producer. He chose the name, Genesis, to mark the start of his production career and produced the group’s first album, From Genesis to Revelation with the single, "The Silent Sun". Both failed to sell well and the group and band soon parted. Between 1965 and 1979, Jonathan King released 18 singles which all reached the Top 75 of the UK Singles Chart. Jonathan King also performed and produced studio "novelty" records sometimes released under his own name or as a pseudonymous band or artiste, several of which made the charts. Pseudonymous included: St Cecelia (Leap Up and Down (Wave Your Knickers in the Air) No. 1971), The Piglets (Johnny Reggae No 3 in 1971), Shag (Loop di Love No.4 in 1972), and One Hundred Ton and a Feather (It Only Takes a Minute No.9 in 1976). In 1971, Jonathan King recorded a cover version of Hooked on a feeling and added ‘ooga chaka’ jungle chants. The single reached number 23 on the UK Singles Chart . In the same year he produced the Bay City Rollers and gave them their first hit, "Keep on Dancing", which reached number 9 in the UK charts. King set up the record label UK Records in 1972 and signed 10cc. The band made eight UK singles with the label, including "Donna" and "Rubber Bullets". 10cc left UK Records in 1975 for Mercury Records. Other signings to UK Records included Terry Dactyl and the Dinosaurs. In 1973, Jonathan King became one of the original backers of the The Rocky Horror Show and produced the original cast album. 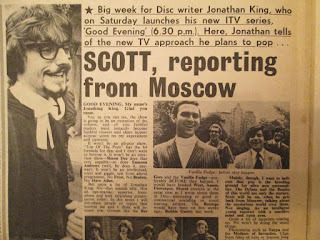 Jonathan King moved away from the music industry and in 1980 was presenting a daily radio talk show on New York's WMCA. He later became the key presenter in Entertainment USA broadcast on BBC2. He was associate producer of the youth TV show No Limits and co-hosted the ITV programme Ultra Quiz during 1983. He continued some music projects, including the supergroup "Gogmagog" (former Iron Maiden members Paul Di'Anno and Clive Burr, former White Spirit and Gillan guitarist Janick Gers, Def Leppard guitarist Pete Willis, and bassist Neil Murray - Whitesnake and other bands). In 2000, Jonathan King was investigated by police about allegations of sexual offences committed against boys since the 1960s. He was later sentenced to seven years in prison in 2001 for sexually abusing five boys, aged 14 and 15, in the 1980s. After his release, King produced several films, albums, and books. In 2015, Jonathan King was arrested as part of Operation Ravine, an investigation relating to claims of child sexual abuse at the Walton Hop Disco in the 1970s and 1980s.